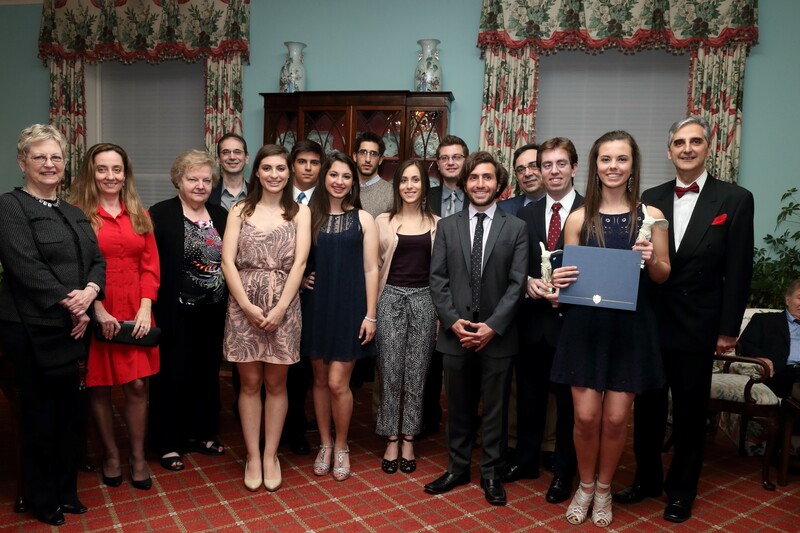 It was a glorious evening to behold when we awarded nine scholarship awards to high school and graduate students. We are accustomed to many memorable past scholarship dinners, but this year’s event did not fail to inspire and impress us. Here are some of the highlights that make it one of a kind. Nine distinguished and promising students of diverse backgrounds in medicine, finance, engineering and sports history! Their biographies are available in our website. They are: 1. High School Category: Katherine Bienek, Eugenia Kakadiaris, Alexander Liapis, Georgia Varvarezos. 2. Graduate School Category: Andrea Marie Gaspar, Ioannis Keramidas-Charidakos, George Nicholas Kioussis, Konstantinos Milios, Apostolos Psaros-Andriopoulos. A captivating and insightful speech on the meaning of education by our own member Professor Lydia Kavraki. A lively and humorous MC, none other than our own member Professor George Zouridakis. A new trophy introduced as a gift to the students! It was a scaled reproduction of the statue of the Winged Victory or Nike of Samothraki. Since 1884, the original has been prominently displayed at the Louvre and it is described by some as “the greatest masterpiece of Hellenistic sculpture.” We wanted to emulate the Oscar Movie Awards, as their award ceremony was happening in the same evening! The organizing committee: Katerina Kourentzi, Kiki Koymarianos, Vicky Georgiadis, Despina Milliou, George Zombakis. The scholarship committee members: Mrs. Cora-Ann Blytas, Dr. Lena Beyko, Professor Christine Economides, Dr. Aris Papasakellariou, Dr. Akis Souvaliotis. The event photographer Sarados Millios. To all our donors who make the scholarships possible. This entry was posted in Scholarship dinner and tagged Scholarship. Bookmark the permalink.